Making science relevant to teenagers. There’s a difficult thing to do! It’s not as simple as: “Oh you like explosions? Let’s learn about the science of explosions!” I mean, yes we could do this however it’s such a small part of “science” that what will I do with the other 175 days of school???? 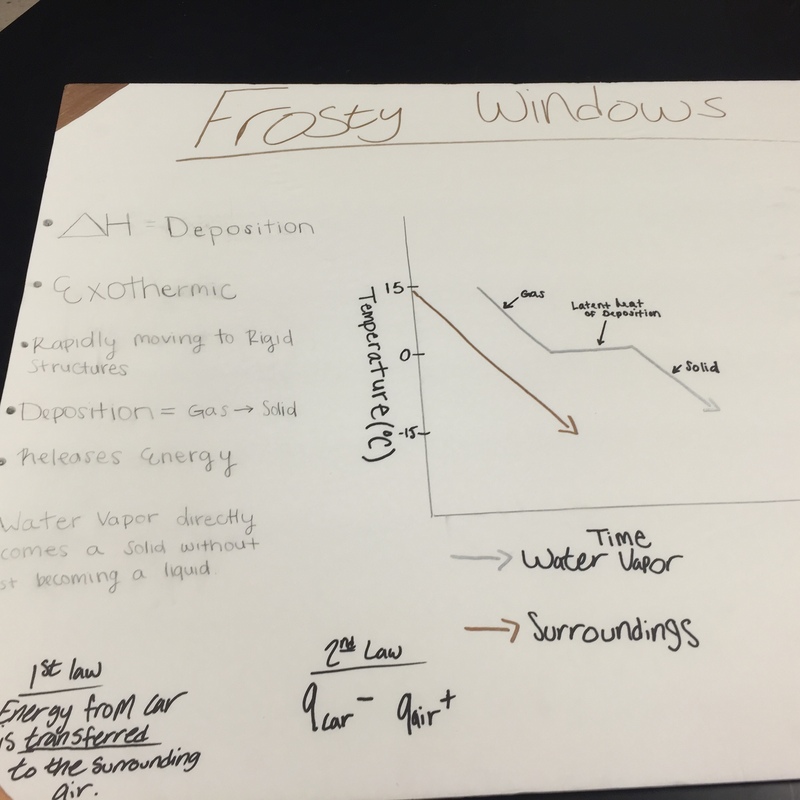 The challenge is finding ways of making all science concepts relevant to the teenager who is more interested in the latest snap chat lol I am trying to find ways of engaging students in the required concepts of reactions and stoichiometry with their curiosity of blowing things up but of course this requires time and it requires getting educators out of their comfort zones of the “usual” teaching routine. I am not just talking about other educators, I am most definitely including myself. We get comfortable with a certain order and then stick to it. It can be very hard to step-out and try something new and I am accepting this challenge. I’ve made small changes for about 3 years now and am beginning to LOVE it! One of the changes I’ve made is using culminating projects as the summative assessment for standards we have completed. Students seem to enjoy them and I can still check for understanding. Sometimes I also have another supporting assignment but not always. 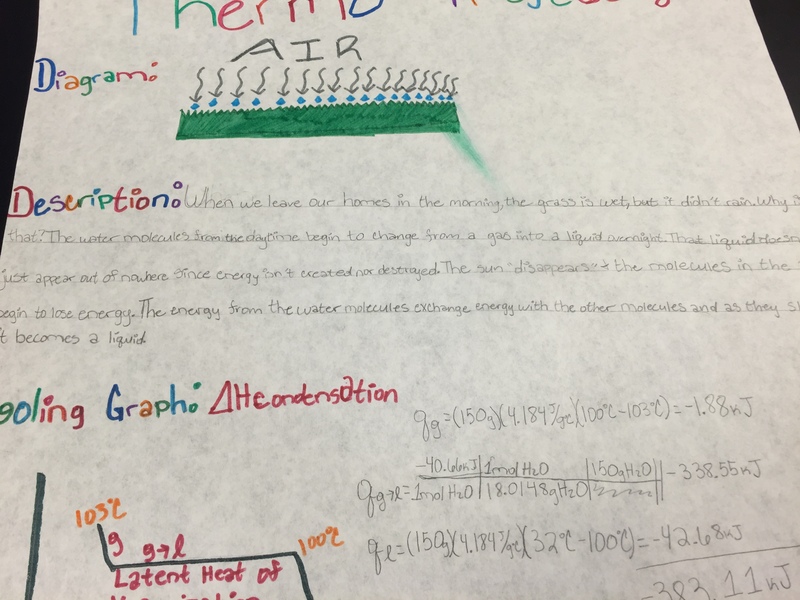 I’m (currently) a fan of poster projects because 1) students always check out each others work and 2) I use them later for reviews and/or a way to assess student understanding of the concepts by having them check each other’s work. 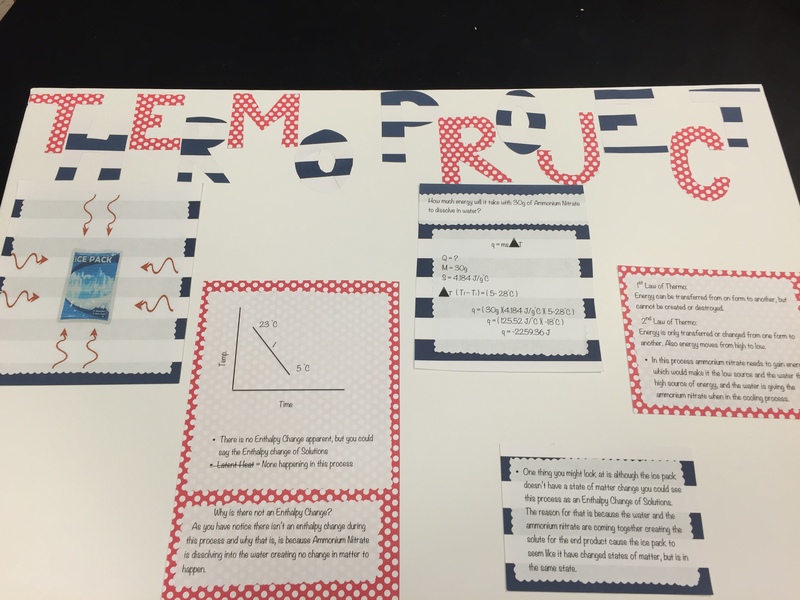 What makes a good culminating project? 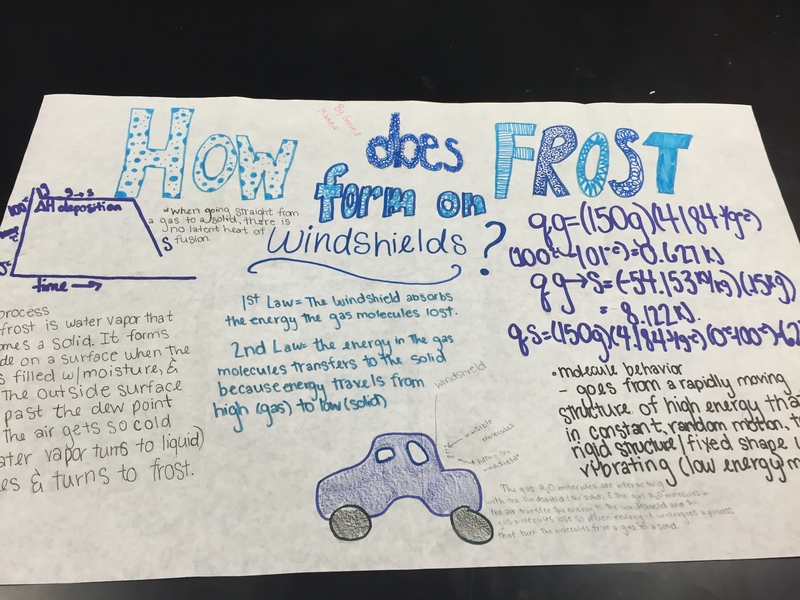 Finding ways to tie in everything they have learned while applying it to something that tweaks a student’s interest. 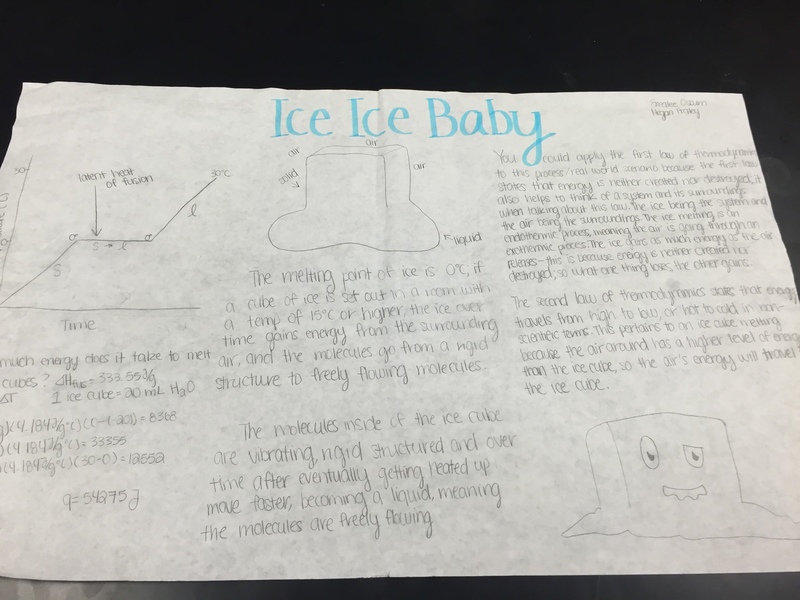 This type of project typically goes beyond the general expectations set by standards and if you design learning scales, can be your step 4! (I love when I can layer lesson planning!) 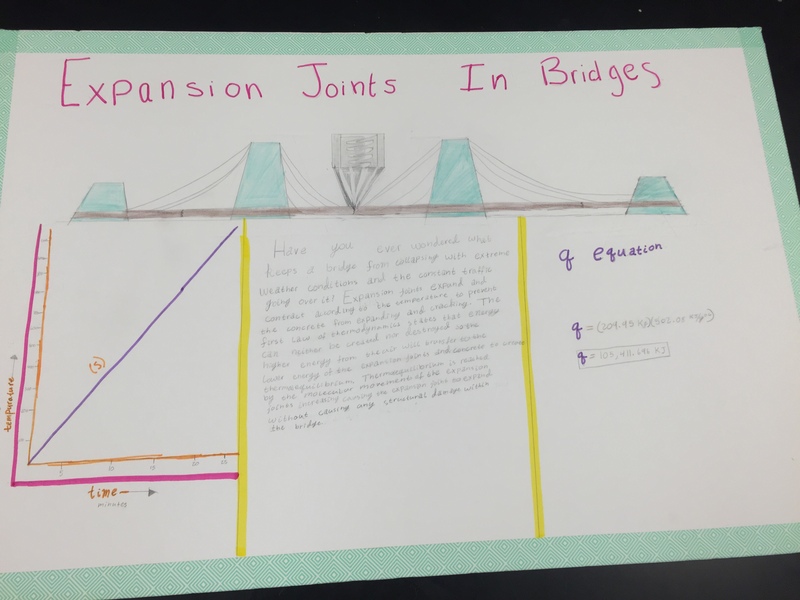 Below you’ll find examples and explanations for different types of projects I have implemented in my classroom! If you have any questions please let me know! 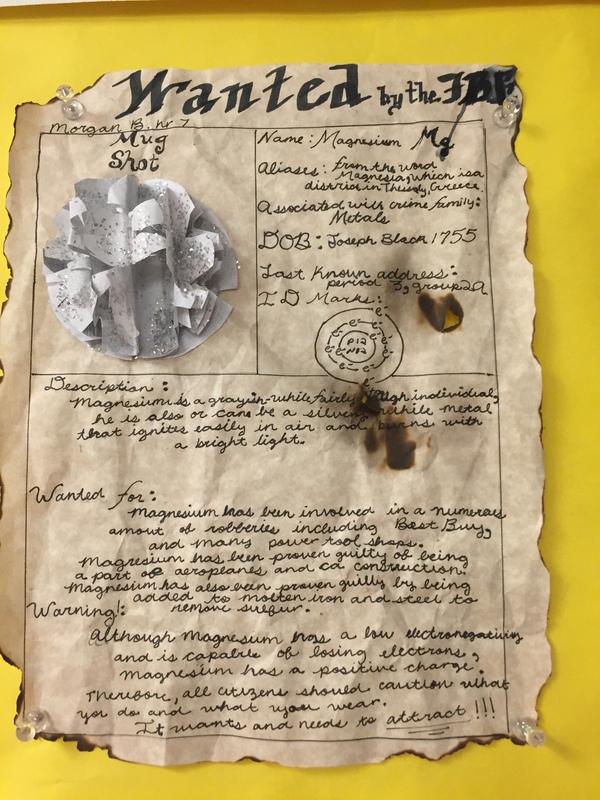 Looking for a fun way to incorporate all the information provided by the Periodic Table? I’ve done this project for 6 years and my students love it every year! 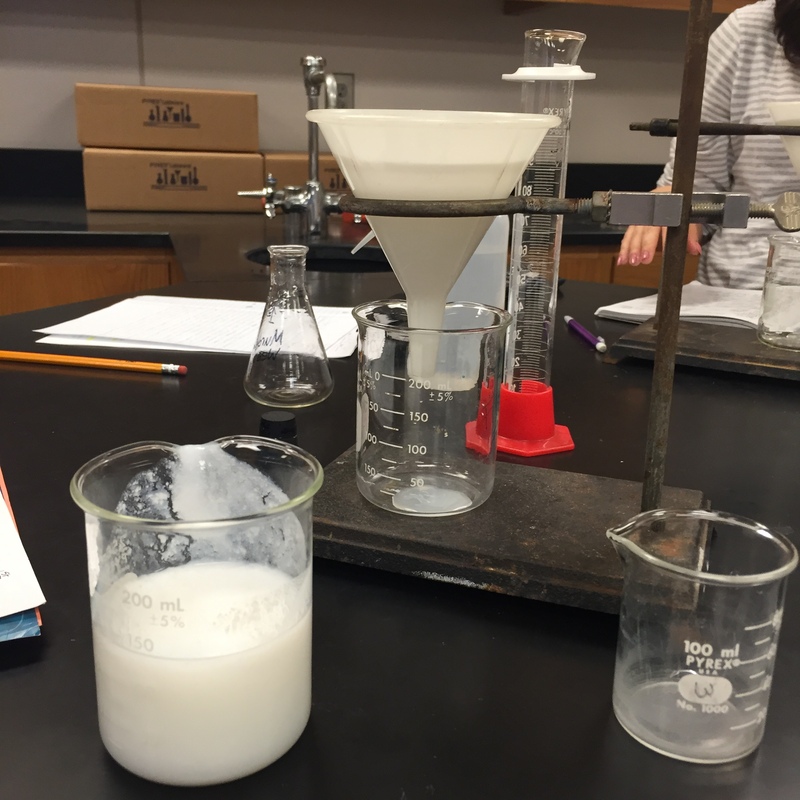 I even have Chem 2 students who ask to do it again when they see Chem 1 working on them! 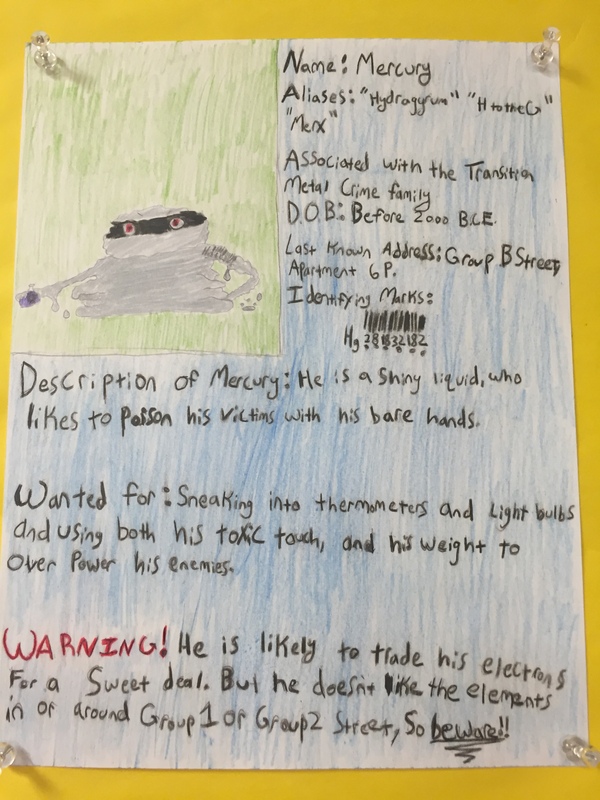 This project is called Federal Bureau of Elements Most Wanted. 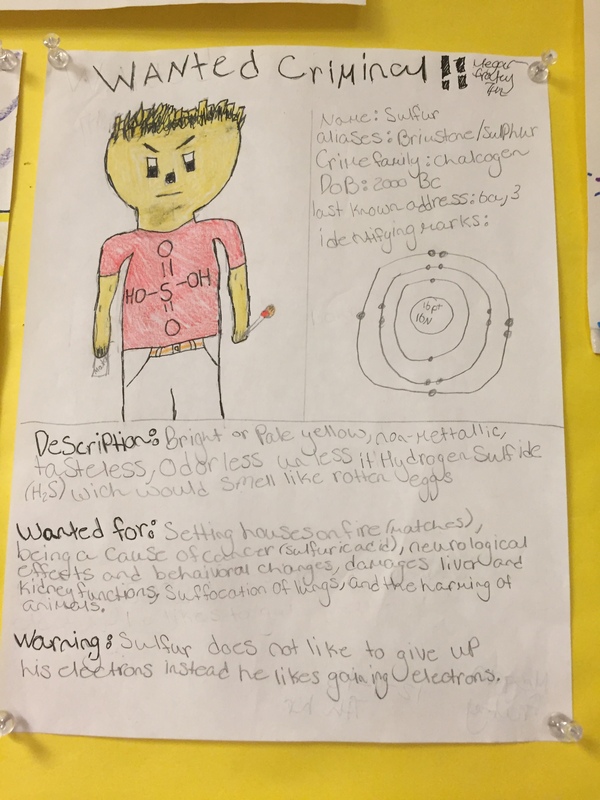 Students create element criminals based on the properties and locations of their assigned element (you can also let them pick but I make sure no 2 students in the same hour have the same element). I usually give students a week for this assignment but just one in-class work day. 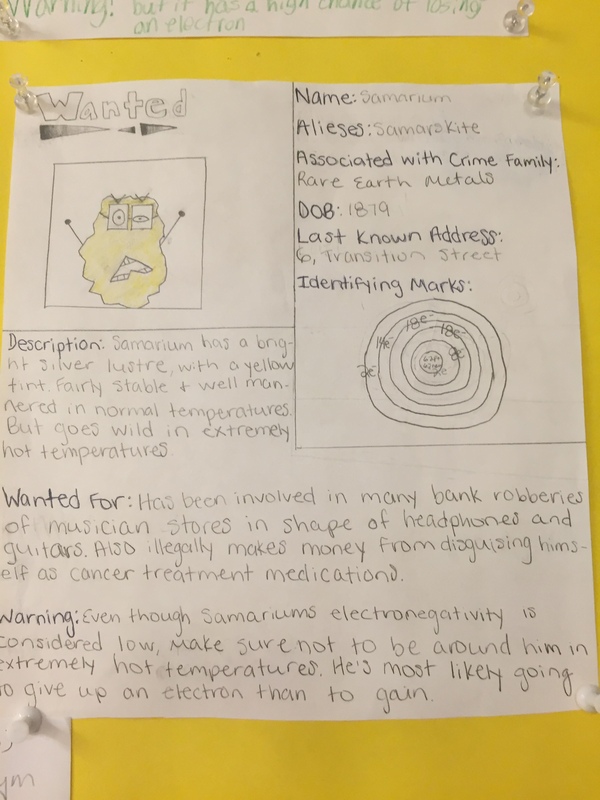 I give students a guide to help them find all the required information then they build the Most Wanted Poster as if the element was a real person. This way descriptions don’t turn into a list of properties which would be reflective of how they found the information. 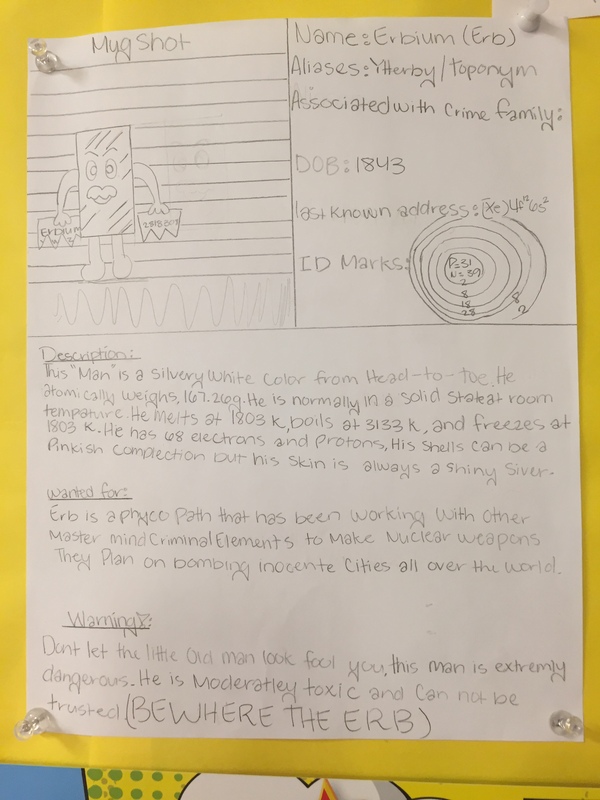 The poster design requires students to take all that information and write it up differently. A free, step-by-step guide can be found here if you are interested! 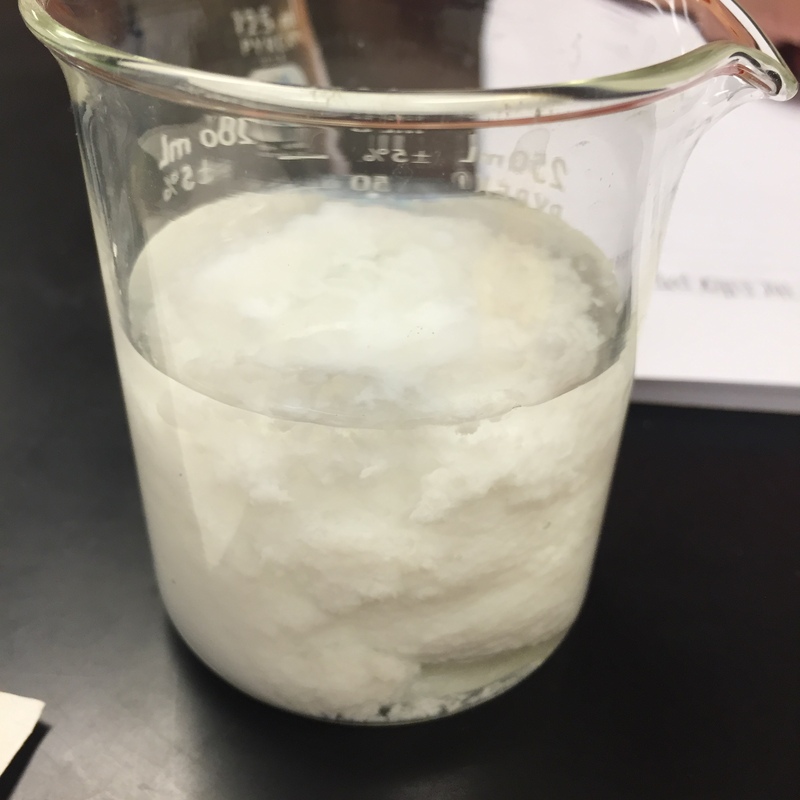 This is probably my biggest project and is done after my students have learned how to determine limiting reactants, use molarity, performed some labs, and understand reaction concepts. 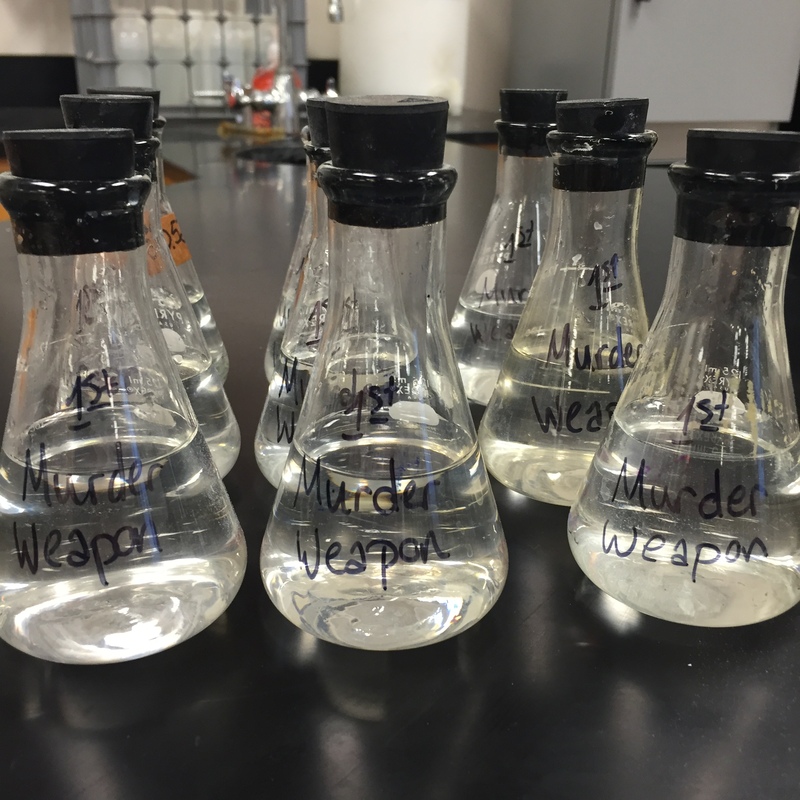 This is my Murder Investigation project and students discover who poisoned Miss Scarlett based on results obtained during a lab that they design. 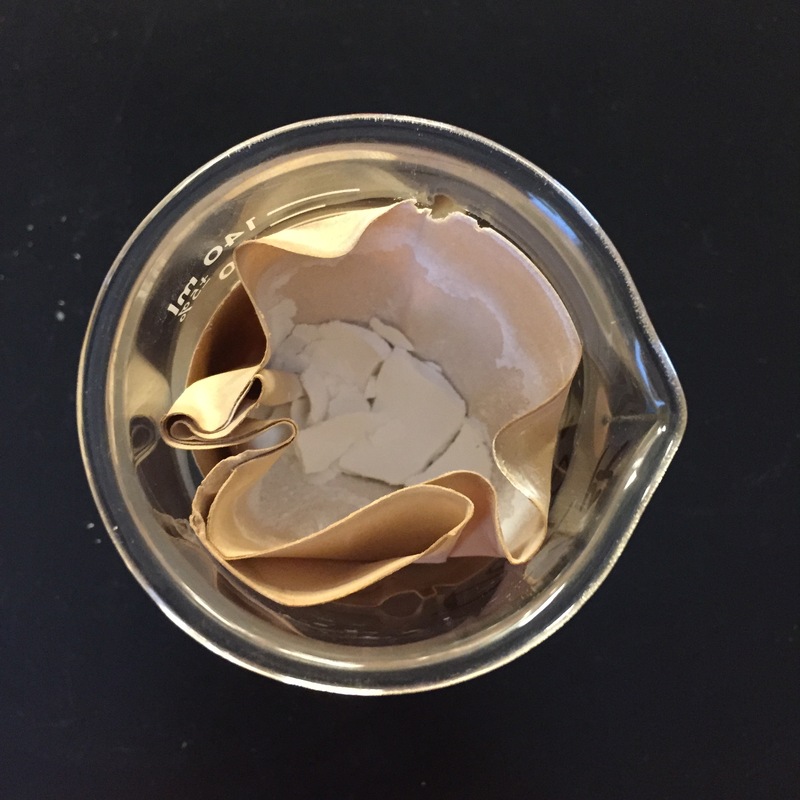 Students use solubility tables to determine what reactions will produce precipitates, design a lab to separate mixtures, calculate theoretical values of product masses then compare those to actual values obtained during the lab, and tie all that information into making an accusation on who poised Miss Scarlett: was it Professor Proton? Eli Electron? Major Bohr? Mr. Beaker? Or Marie Curium? My students enjoy trying to figure it out and love it when they see the results! 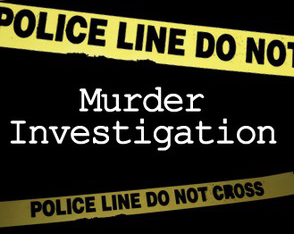 This investigation is really student driven so my job is to simply facilitate when needed. 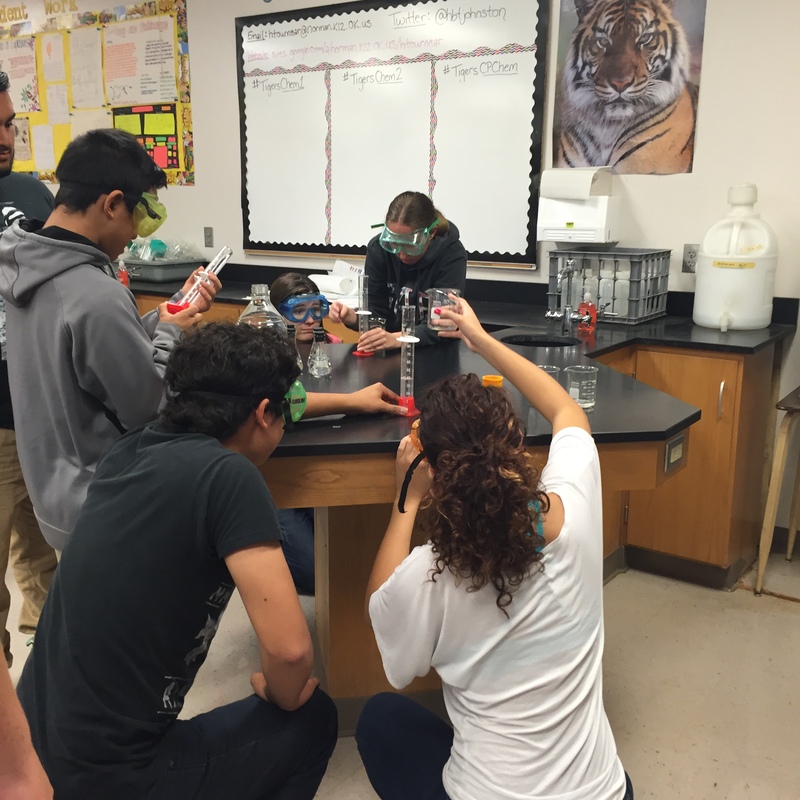 Students work very hard during this lab and I love watching them figure everything out! 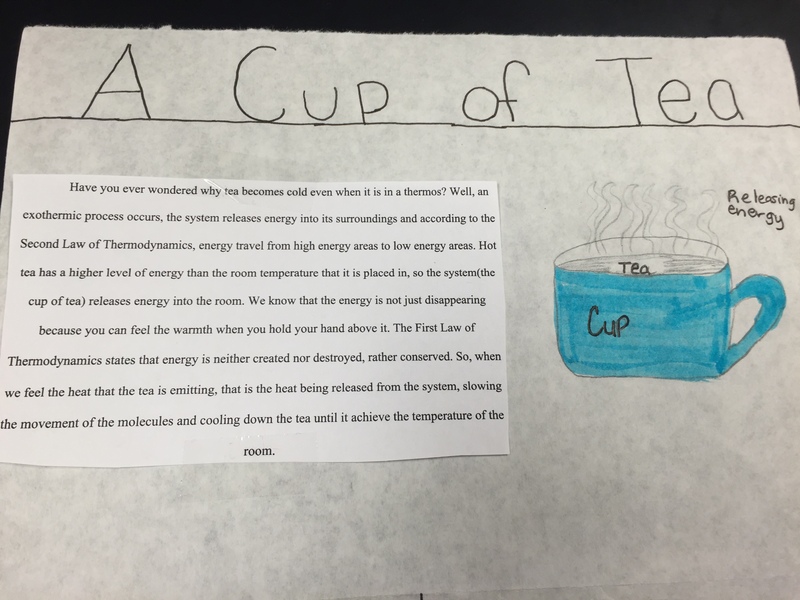 This year I tried something new at the end of the thermochemistry unit and asked my students to pick a phenomena that occurred in the world around them that could be explained using thermochemistry. I got great results! 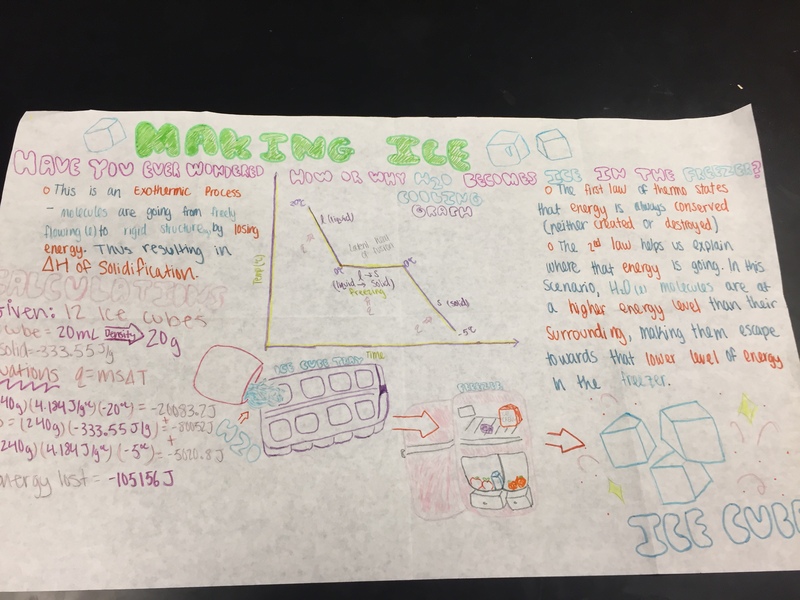 Once a topic was chosen students were asked to draw and label a heating/cooling graph, include a visual of the phenomena that explained molecule behavior, a description that explain the thermochemistry applications (including enthalpy changes and the 1st and 2nd Laws), and they had to calculate the amount of energy absorbed/released during their process. 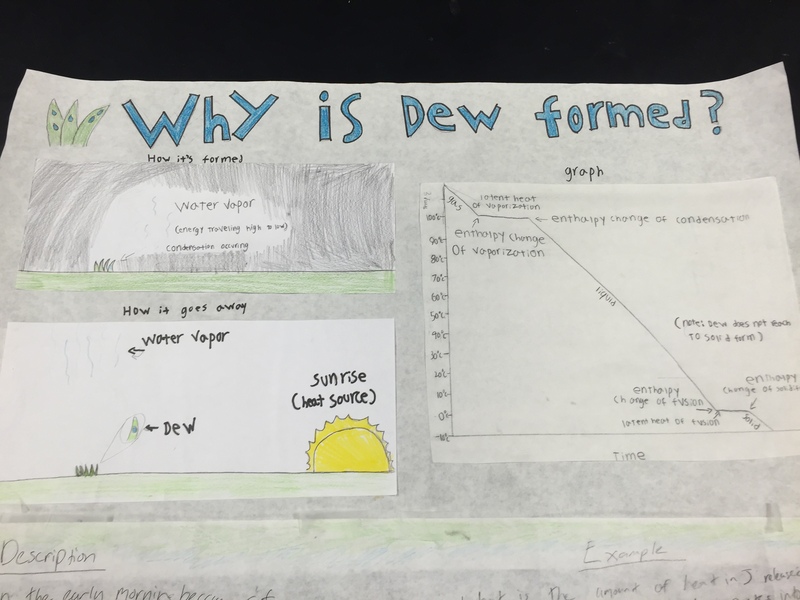 I know this post was picture heavy but I am so proud of the work my students have created with their new knowledge! My Chem 2 classes will be working Nuclear Chemistry projects this week and I look forward to those results soon! What type of things have you done in your classroom that allow students to apply their learning? ?